Taking a break from the confusing and unsettling jobs number today, I wanted to briefly highlight a post by my CBPP colleague Chris Mai on the loss of jobs in local education over the last few years. Whenever someone raises this issue, my first thought is “ok, but what’s happening with enrollments?” That is, it’s not an obviously bad thing for schools to adjust staffing levels to demand, i.e., enrollment. As shown in the figure, that’s not what’s happening here. 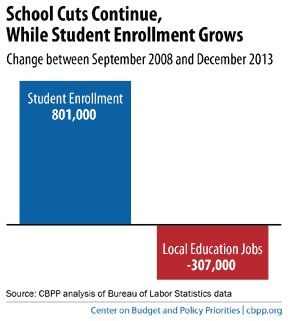 Mai makes that point that these jobs cuts are occurring when enrollment has been growing. As an aside, looking at this figure reminded me a Sen. Rubio’s big, bad idea to turn all the safety programs over to the states. My strong sense is you’d see a lot more picture like the one above, where too many states would be unable or unwilling to ramp up services to meet needs. Share the post "The Decline in Education Jobs, Properly Measured"
7 comments in reply to "The Decline in Education Jobs, Properly Measured"
As a teacher let me say that nothing improves education for students more that having more time with a teacher. I’ve heard people say you can’t throw money at the education problem, and I strongly disagree — fewer students per teacher is always better. Context please. Student enrollment is up less than 2% so probably not a lot of suffering going on unless the cutbacks are concentrated. The bigger concern is rising unemployment in that 300,000 is a huge number representing 1/4 % of the U.S. workforce, though that’s still only 3.5 % percent of the roughly 7% unemployed. We can double 3.5% to 7% if we use the term unemployed to mean over and above the 3 to 4% normal full employment levels. 300,000 is also 10% of teacher population and 4 to %5 of education employees. Moreover, if we care about education, the declining job prospects are obviously not a good way to attract people to the profession. One could say good, only the truly devoted will follow the calling. A bigger question is how we wind up with public primary and secondary education costing $12,000 a student, and student to education employee ratios of no greater than 10 to 1. The New York Times chart shows employees to 100 students ratio, the lowest being Utah with 11 employees for 100 students, the highest is Vermont, at 25. Are these numbers correct? 9 students per employee in Utah? 4 students per employee in Vermont? I know there are principals, school nurses, custodians, bus drivers, special ed teachers and gym teachers, but does it all add up? Doing the math, I should correct my work in that if education (and by extension teacher) employment drops 10%, on average a class size of 20 will eventually grow by 2 students, and the 2% growth in student population adds another student to almost every other class. Class sizes anywhere near 15 to 30 will grow by 3 students. Though not consistently correlated well with performance, past a certain threshold, common sense tells you too big a class makes a big difference, and impedes education. If the cutbacks are not evenly distributed, then it’s 4 to 5 students, if it occurs where larger class sizes predominate, then the threshold is much more easily breached. Going from 25 to 30 in a difficult environment probably makes a difference, but I don’t have references to cite. But the thing is that 40+ students per class is what is going on in many school districts. 25 students is a dream now. I don’t have time to dig into all the stats that Smith puts up, but here is another factor that I never/seldom see mentioned in all the budget or teacher-student ratios: back when Sen Kennedy got the Americans with Disabilities Act passed, and when the Feds passed Title 1 regulations, suddenly (under Federal law), school districts had to service **every** student. This means students who may be severely disabled, including requiring one full-time assistant per child for many years of life. The Feds passed laws that local school districts had to fulfill, without at the same time granting (enough) money to fulfill the requirements of the laws. These ‘we won’t give you money to do what we’re requiring you to do’ laws are referred to as “unfunded mandates”. The unfunded mandates have altered the numbers game. Kids who were never in the public classrooms in the 1960s are in the classrooms today, sometimes with a full-time aid. That may make it *appear* that there are lower teacher-student ratios, but this is not necessarily the case. So be wary of the education stats. The education system needs to be uplift for the betterment of all. We should support noble projects like http://www.rockethub.com/projects/35955-be-in-education to promote education system.